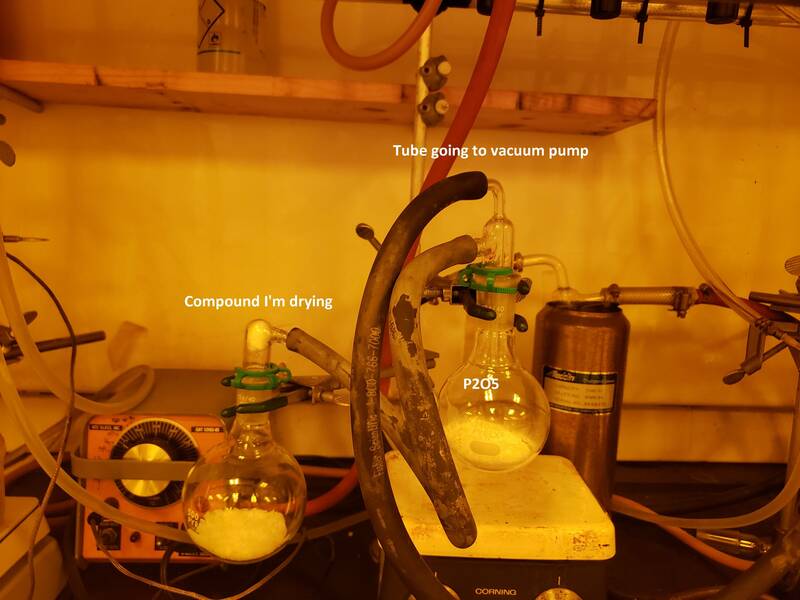 i'm trying to make a carbamoyal chloride of pyrrolidine-2-nitrile, the literature synthesis involved deprotecting the commercially available boc pyrrolidine nitrile with TFA to give a TFA salt which can easily be dried, this is the treated with 2.1 equiv 2,6-lutidine and 0.4 equiv triphosgene, this however gave the triflouroacetamide not the carbamoyal chloride. so I decided to make the hydrochloride salt instead originally following a literature boc- deprotection procedure which used two phase conc.HCl/Et2O, this worked but the resulting salt was impossible to dry, so i moved on to a deprotection using 2M HCl in Et2O (idea being that no water is present), however it turns out some water was present in the HCl/ether and i could not dry the salt and it did not go to completion. I need some ideas as how to deprotect the boc amine in strictly anhydrous conditions or dry the hygroscopic salt. You can dry any solid with a P2O5 setup. Are you familiar with it? You can remove Boc with ZnBr2 in DCM. Why do you think changing from TFA to HCl salt will solve the problem with forming the trifluoroacetamide rather than the carbamoyl chloride? I can't see how it will affect that step. I know it isn't much fun, but you can phosgene in toluene from Aldrich, which might be a better way to go. TFA to HCl salt will solve the problem with forming the trifluoroacetamide rather than the carbamoyl chloride? I want the carbamoyal chloride, the triflouroacetamide forms by activation of the trofluoroacetate counter ion (maybe forming trifluoro acetyl chloride from phosgene) the hydrochloride salt obviously can't do this. no i'm not familiar with that, would a hydrochloride salt tolerate P2O5? Do you have anhydrous methanol or ethanol? If so you could generate anhydrous HCl in situ by addition of AcCl. Oh my boy, you are about the learn the most powerful drying technique in organic chemistry! P2O5 is about the most hygroscopic material known to man. Borek once found a great citation about how powerful a drying agent it is, I would be hard pressed to find it. Take two rbfs and put your chemical in one, and about 20 grams of P2O5 in the other. Connect these with rubber tubing on adapters, and connect the P2O5 rbf also to your pump (either split adaptor or a 2 neck rbf. Put cotton balls in the adapter, you don't want P2O5 contaminating your pump. Pull vacuum on it by leaving on pump overnight. All the moisture will be transferred from your material to the P2O5, it will sort of congeal or even form liquid. If your compound is still not dry, just swap out fresh P2O5 and keep going. This has literally never failed me. P2O5 never contacts your chemical so compatibility doesn't matter. Its just gas phase transfer of water from a chemical to the P2O5 that wants it way more. This is the set up. Figured a demonstration was in order since I'm drying trimethylolpropane right now. seems like a pretty neat solution, thanks for that, due to limited time me and my supervisor just decided to work around the problem by making a slightly different carbamoyal chloride.